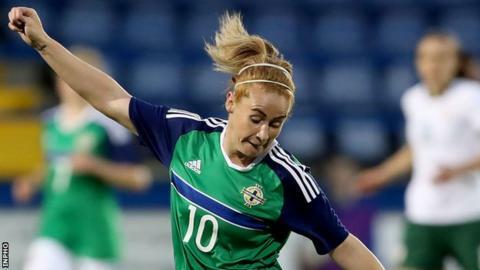 Northern Ireland's women finished third at the Alanya Gold City Cup tournament in Turkey after beating Uzbekistan 2-1 on Tuesday. Sarah McFadden put Northern Ireland early on with Rachel Furness doubling the advantage in the 10th minute. The Uzbeks pulled a goal back on 66 minutes but despite producing further late pressure, they were unable to force an equaliser. Furness' strike was her sixth goal in the tournament. The Reading Ladies player notched a hat-trick in the opening 6-0 win over Jordan and was also on target in the 3-1 defeat by France B and 4-0 victory over Kazakhstan. Alfie Wylie's side were using the Turkish tournament as part of their preparations for the World Cup qualifying campaign which starts in August. Last month's draw pitted Northern Ireland with former world champions Norway, Wales, Belarus and the Faroe Islands. From the nine groups - two with six teams and seven with five - nine group leaders will qualify automatically along with the three best runners-up, while the six other second-placed teams will face play-offs for the final three spots. Matches will be played from the 26 August this year to 22 September 2020.